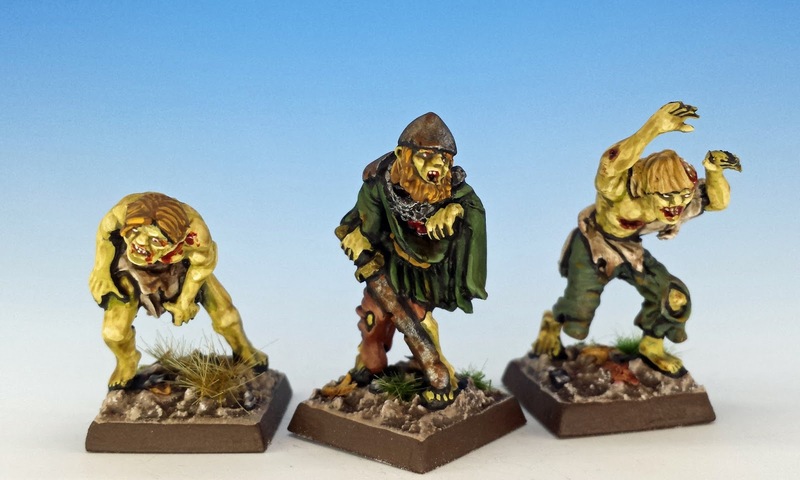 Saga Revenants was a limited edition set that Gripping Beast produced in 2015 for its skirmish game, Saga. It introduces zombies as a playable faction, letting them battle alongside Anglo-Danish huscarls and Viking Bondi. 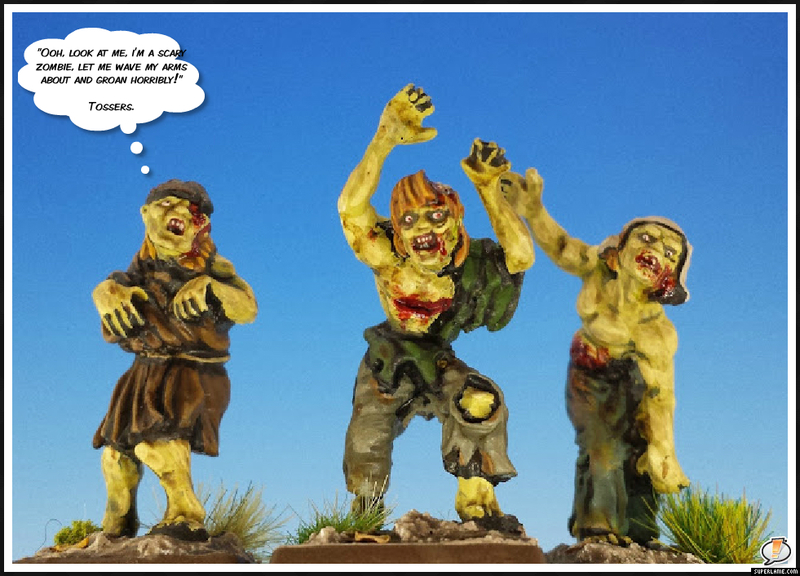 It's charming to inject a small dose of the supernatural into a historically-based wargame. Indeed, Saga Revenants slots right into the world of Saga since Scandinavian and Celtic mythology all feature some form of the reanimated dead. (As a child, one of my favourite myths was the story of Hel, Norse goddess of the underworld, arriving with her army of corpses at the battle of Ragnarok in "Naglfar", a giant ship fashioned from dead men's toenails). For Oldhammer aficionados, Saga Revenants has an extra grip because the 50 or so zombie miniatures that come with the set were all sculpted by Bob Naismith, the lead sculptor at Citadel in the mid-1980's and the man responsible for many of Warhammer's most iconic designs (see Axiom's excellent interview with Bob for some wonderful insights into the man and his influence). 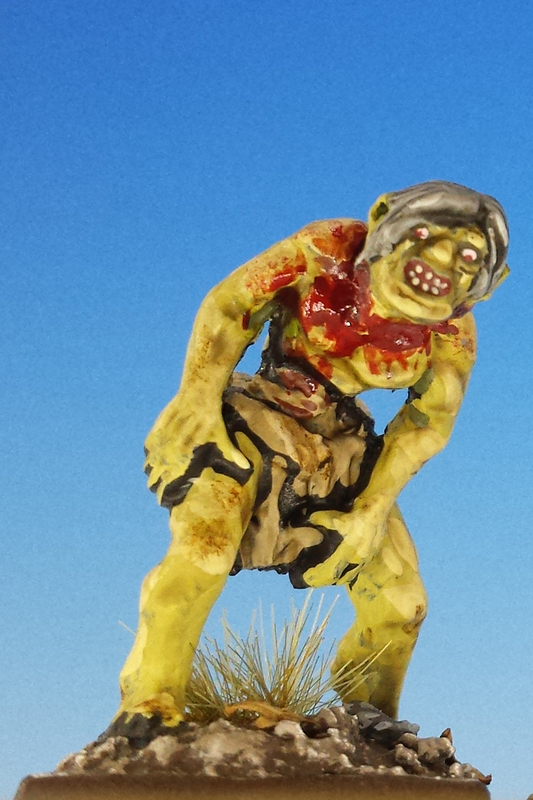 Bob Naismith's sculpting talents are on full display with these miniatures. 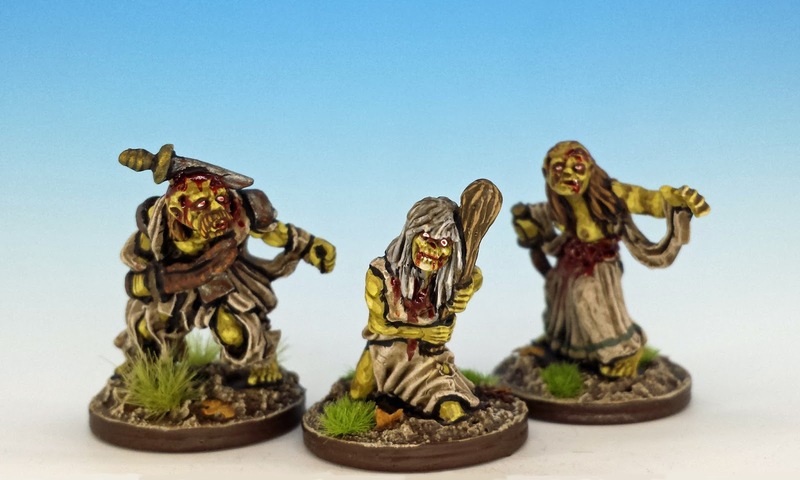 As Barks said in his recent post about Revenants, they are a "blend of horrific and comical". Although some of the details (especially tattered clothes) are a chunky, the sculpts more than make up for it with an overall sense of personality and movement. Many of the zombies are palsied and limping, with crimped hands and twisted limbs. Their faces vary between friendly smiles and grimaces of insufferable pain. In other words, these are emotive zombies, not the sullen, expressionless corpses that you usually get nowadays (I'm looking at you, Walking Dead). 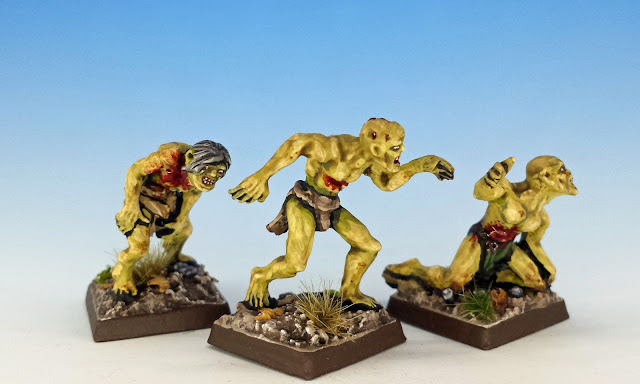 I speed-painted 48 zombies in a few weeks. My recent experience with speed-painting have been spotty at best (cough, cough, Mansions of Madness, cough), but I think I'm slowly improving. 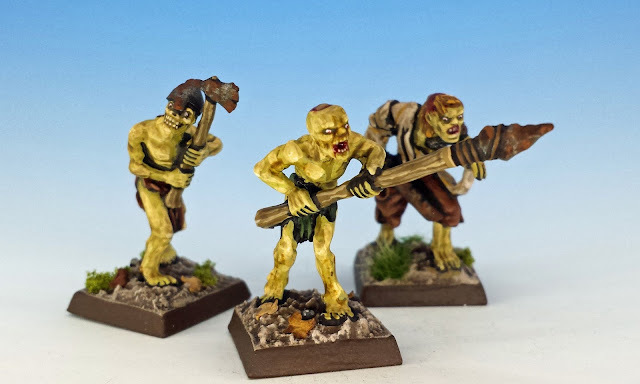 My technique for painting these miniatures owes a lot to Sorastro's tutorial on painting zombies. I blocked in a few simple colours (medium green fleshtone, khaki clothes, terracotta accents, etc.) 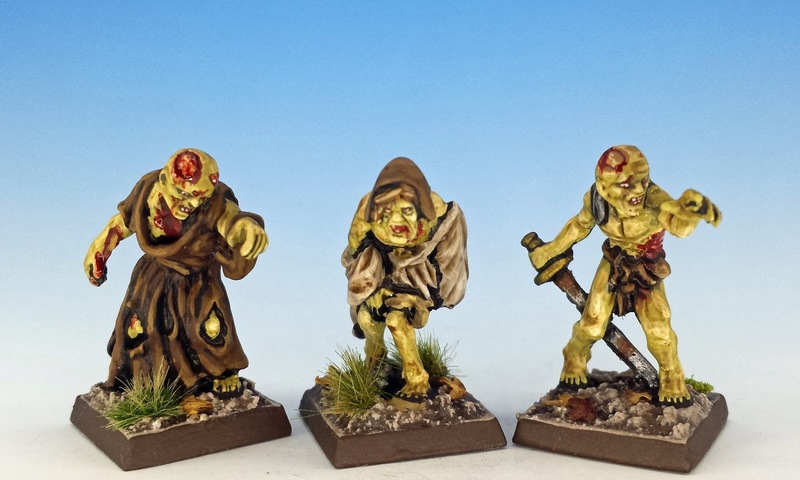 and then enhanced these with a sloppy layer of highlighting. The whole package was then covered in Army Painter Strong Tone - and when that was dry, I added blood, rust, facial details, and more blood. Above are the "Grave Pits" that come in the Revenants set. 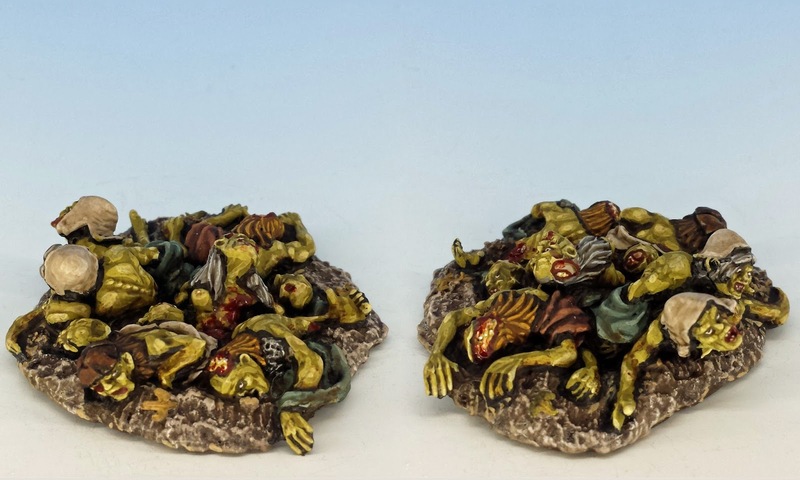 These are wonderfully sculpted eruptions of zombies clawing out of the ground -- the Revenant player can use these Grave Pits to attack his opponent from below. It's not pretty. 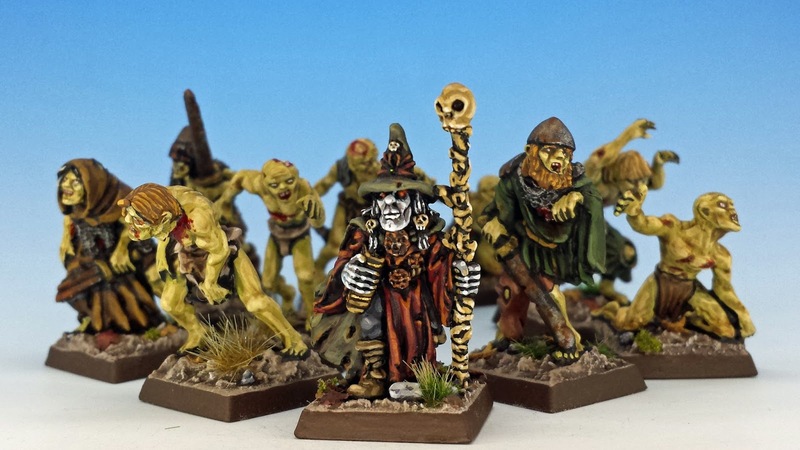 A warband of Revenants is led by a Necromancer. But I didn't paint the Necromancer included in the set -- that would be an insult to my own Lichemaster. Yes, Heinrich Kemler shall take his rightful place at the head of my legion of undead. But he will need a Saga appropriate identity. I dug around my library and found a wonderful typed monograph called "Legends of Icelandic Magicians" (1975) by Jacqueline Simpson. It contains some fascinating legends about an evil wizard named Gottskalk the Cruel who "gathered together all the black spells, which had never been used since heathen times, and wrote them all down in a magic book called Red Skin." Sounds about right. They've added a lot to my Saga game! I like a little fantasy in my historicals. I'm a big fan of your painting :)Masterpiece! You are much too kind, Michal. Great stuff! The necromancer is perfect. I really like the rust and red eyes. 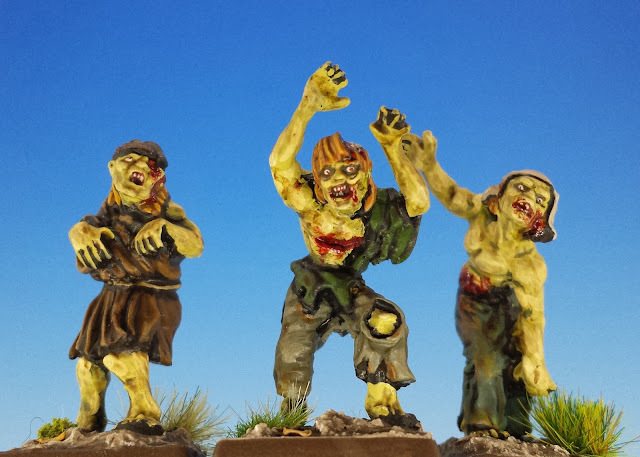 My favourite part of painting zombies is adding the gore. Rarer than a hens teeth the necromancer figure; that is the Lichmaster from McDeath issued in limited edition decades ago. He's the one and only Necromancer, as far as I'm concerned. Painted so fast you still made them look better than most peoples best work. But they do look pretty flippin good mate. Like their eyes the most, nice subtle red dots add all sorts of creepy character. I vacillated on those eyes. I really like the glowing blue eyes (which Barks does so well for his Revenants) or glowing red eyes. But I finally decided for more normal eyes (whites with red pupils) because the position of the pupils can give so much personality to a miniature. I like the greenish colour that you've chosen for the flesh. I particularly like the guy with the sword embedded in his head. Thanks SW. Yes - that miniature is one of my favourites too. A classic Naismith. Lovely job. 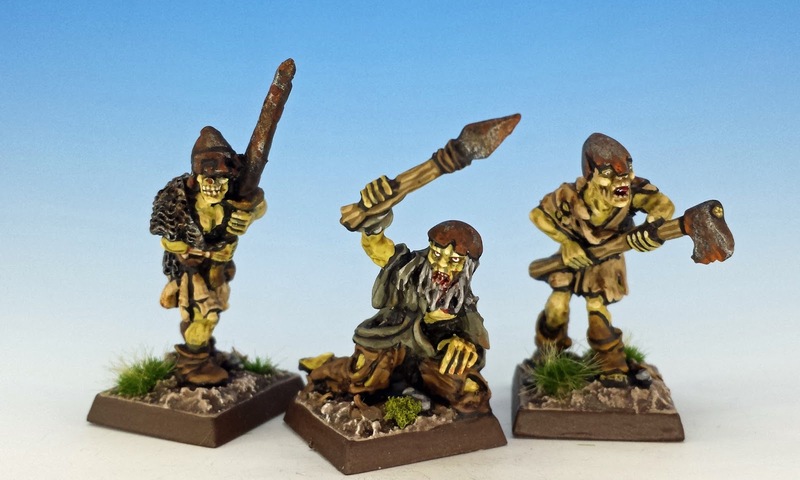 Mine are still languishing in the box waiting their turn on the paint table! At least you nabbed yourself a box when they were still available. I can't wait to see what you do with them. Good lord those are vile. I can practically smell them. Some zombies are such show offs. I love that you decided to go with square bases. It makes me feel like I might be able to use my celtos barbarians as Jomsvikings since it's a square party! Disgusting...and superb at the same time...great job! They look splendid. Most gruesome. Say...we never did get a Terror of the Lichemaster battle report did we? I expect you to remedy that at some point. I have to play it first. But it's coming... I can feel it... it's coming! Wow. 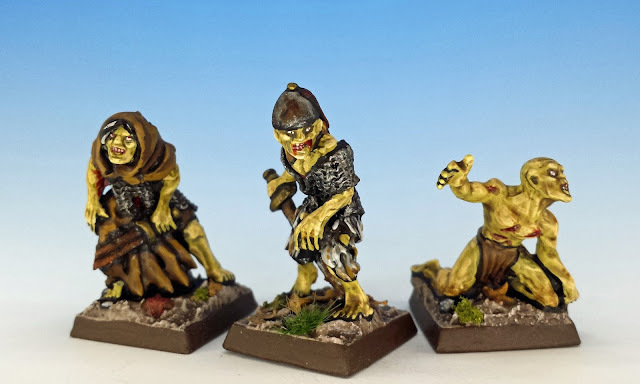 I didn't know of these minis and I love them, excellent paintjob, strikingly good! Fantastic! I've now subscribed to Sorastro's channel and want that Gripping Beast set. I need to make some money. I'm afraid that it's out of production. I wish they would reissue them. But I'm afraid Gripping Beast won't -- the same thing happened with their boxed set of Skraelings. I came too late to that party and have always regretted it.